We all love the tales of the god of thunder, Thor, but the team at Microgaming loved it so much they created a slot game about it. Well Boku Slots also has a little hankering for Norse mythology and we wanted to see how well it has transferred into a slot game. Thunderstruck is a 5-reel 9 pay line game, with a mythical 96.1% RTP for the players. It has been around since about 2004 and has built up quite a following. 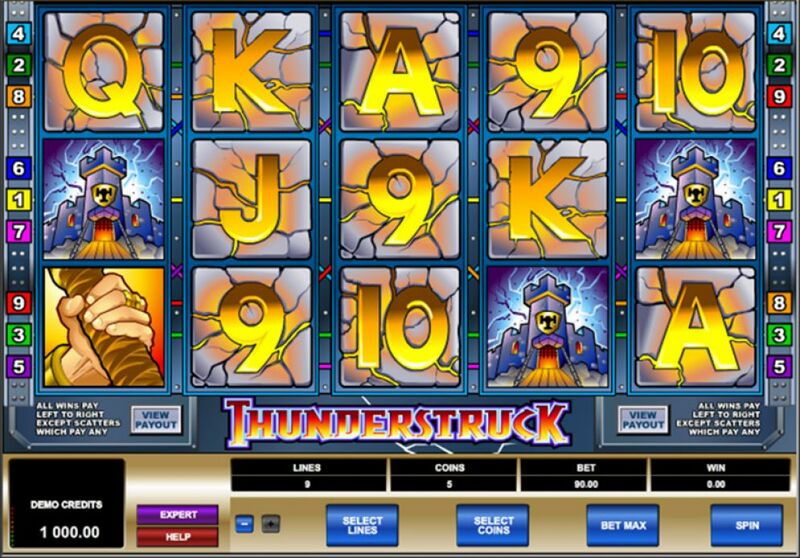 As far as online slots go Thunderstruck is one of the more basic games we have seen, with limited features and very low betting amounts. That however, has not detracted from the popularity of this game. Bet Amounts – Betting on Thunderstruck begins at just 9p for all nine lines in play and can be increased to a maximum of 45p. You can however click the expert button and alter the amount of lines in play and the coin level. But, for 45p per spin for all 9 lines to be active, this isn’t going to be too much of a dent in your pocket. Wild Symbol – Thor himself is your wild symbol and if you create a winning combination with one Thor wild, you will automatically double that line win. Thor substitutes for all other symbols except the scatter and he is the highest paying symbol too, offering 10,000 coins if you land 5 or more on a winning pay lin. Scatter Symbol – The mystical rams are your scatter symbol and landing 3 or more will trigger the bonus spins feature. You also have the addition of scatter wins being added to your pay line win, so by landing 2 or more on a winning pay line you can enjoy a little extra bonus. Bonus Spins Feature – By landing 3 or more rams you will trigger this feature and be allocated with 15 bonus spins. All wins during the feature will be tripled and the spins can be retriggered during the feature making the potential of more wins much bigger. Gamble Feature – As with many other Microgaming slots there is the added gamble feature to play on Thunderstruck, if you wish. Whenever you land a win you have the chance to hit gamble. You will be shown a face down card and you have to choose either the colour of the card, or the suit of the card. If you guess correctly you will win either 2x or 4x your bet, but if you guess incorrectly you lose it all. Overall, we have nothing but love for Thunderstruck and of course Microgaming who created it. Considering it is such an old game it still has lots of plus points, as well as being relatively easy to play and the features pay out fairly often. The comic book cartoon style graphics lend it an almost childlike edge reminding us of our cartoon heroes such as He-Man, as do the sounds and music that create the background. Aside from that the game has a lot more life in it and will endear itself to players of all ages.